Though Mildred May Douglas was a champion bronc rider and a star of Wild West shows, she wasn’t born to the life of a cowgirl roughrider. 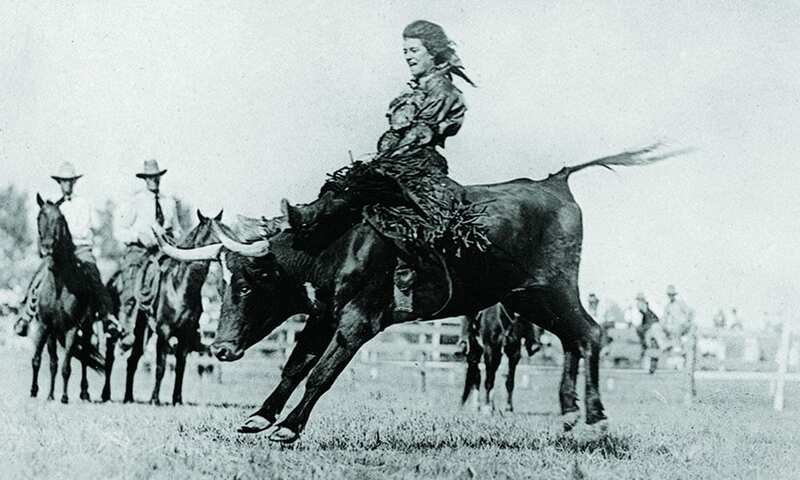 When 24-year-old Mildred Douglas rode a steer in the Garden City, Kansas, rodeo in 1919, it was a big deal. No woman had ever ridden a steer in competition before. But Douglas was no ordinary woman. Born in Philadelphia on August 21, 1895, Mildred knew at the age of 7 what she wanted to be when she grew up. Her parents had taken her to the Barnum and Bailey Circus at Franklin Field in Pennsylvania, and she sat at the end of a row where she could look over the canvas and see the animals and performers coming in. Mildred knew she had to be part of such a show and work with animals of all kinds. She dedicated herself to making her dream come true. At the age of 22, she won the title of World Champion Girl Bronc Rider, was proficient as a trick rider and shooter, and was destined for stardom in the type of shows she saw as a child. Though Mildred May Douglas was a champion bronc rider and a star of Wild West shows, she wasn’t born to the life of a cowgirl roughrider. According to the National Museum and Hall of Fame in Fort Worth, Mildred Douglas left an East Coast finishing school to join the 101 Ranch Wild West Show. She spent years touring the country in rodeos, circuses, and other popular Western shows. Mildred met her husband, Pat Chrisman, while performing with the 101 Ranch Wild West Show. Pat was a horse trainer for silent film star Tom Mix’s mount. Mildred was captivated with motion pictures. Her fascination for the medium, along with her incredible talent and versatility in the saddle, led to a studio contract. Mildred was hired to appear in several films with Tom Mix himself. In addition to her onscreen duties, Mildred trained and worked with horses, lions, leopards, and other animals scheduled to appear in motion pictures and in circuses. Pat Chrisman died in 1953 and Mildred then decided to pursue another dream she’d had; that of becoming a nurse. At the age of 59, she officially entered the profession and took a position at the Comanche County Memorial Hospital in Lawton, Oklahoma. In 1954, she traded in her fringed leather riding outfits for a white uniform and a starched nurse’s cap. Her life as a Wild West performer was never far from her mind, however. She often brought her scrapbooks to the hospital and showed photographs from her other life to interested coworkers and patients. She always spoke fondly of the animals she trained and the audiences she entertained. Mildred eventually donated those scrapbooks, saddles, movie photos, rawhide ropes, and other memorabilia to the Museum of the Great Plains in Lawton, Oklahoma. Mildred Douglas Chrisman died in September 1982 at the age of 87. She was inducted into the National Cowgirl Museum and Hall of Fame in 1988.